Century Building Materials is a family run company that’s been in the building supply business for more than half a century. We serve communities throughout Long Island and the boroughs and we’re ready to help you, whether your project is big or small. We pride ourselves on our customer service. At Century Building Materials we have a knowledgeable sales staff that’s schooled in a number of areas. Whatever the job, we have people who can help. Some of our employees are ex-contractors, others specialize in certain types of jobs, some are skilled in reading building plans. If you have a question, we’re here to assist you. We keep a large variety of products in stock. If you see it in our showroom, we’ll get it for you. We stock high-quality products at competitive prices for all your building needs. From small do-it-yourself jobs to large commercial and residential jobs, we have what you need. You want your project to be successful and Century Building Materials knows you’re concerned about the finished product. That’s why we have a life-size outdoor display center. You won’t just thumb through samples and catalogs. We’ll show you what our products will look like on a home’s exterior or walkway. Our customers know this and often bring their clients in. We invite homeowners to come in and see what their projects will look like. Century Building Materials is Long Island’s exclusive distributor of Dryvit products. Dryvit is a unique combination of exterior finish and insulation that will beautify homes and also make them more energy efficient. Dryvit is affordable, durable and will protect your home from bad weather and water damage. It’s been proven to reduce heating consumption by 24 percent and cooling consumption by 18 percent. We can customize colors for your exterior project at our onsite Dryvit mixing facility. 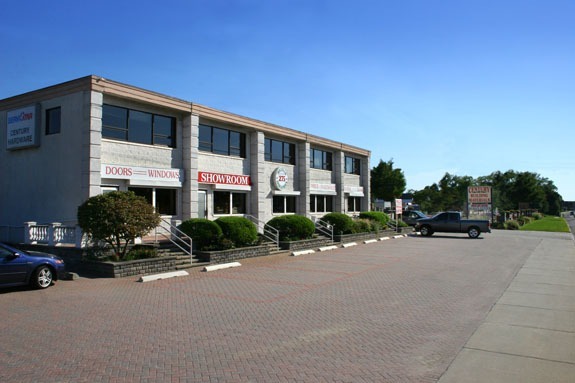 Whatever building products you need, you’ll find it at Century Building Materials. We stock Lumber, Moulding, Decking, Doors, Drywall & Acoustics, Roofing & Siding, Windows & Skylights, Rebar & Mesh, Insulation, Steel Studs and more for your building needs. We’re also committed to the environment. Century Building Materials offers green products such as permeable paving stones that absorb rain water back into the earth rather than causing runoff which can cause erosion and pollution. Century Building Materials has it all. We want you to make us your one-stop destination for all of your project’s needs both big and small.